The day was broken into three sessions. Since there were three groups who rotated through the sessions in different orders, they weren’t really a progressive sequence; just different stuff. Our first session was called Groundwork, taught by the Lexington officers. The plan was to begin the session working the horse on the ground, and end up mounted. The plan was to walk the horses through or over various obstacles (mattresses, water, flapping streamers, wooden boxes, a teeter-totter, etc), and after getting the horse comfortable with them, mount and repeat them under saddle. I ended up spending the entire session on my feet, because Crossbo’s ground manners were so pathetic I didn’t think we had made enough progress for me to mount up. One of the instructors was my neighbor, who spent a lot of time working with me and Crossbo and declared that he was probably the worst horse she had seen. I didn’t ask if that meant the worst in that session, or the entire clinic, or her entire career. For the groundwork, we were using some of the techniques and tools popular in natural horsemanship work, including rope halters and training sticks similar to this. Lisa finally decided the stick just wasn’t going to work with Crossbo, and threw it aside. Later in the session, her partner was working with us, and she warned him that Crossbo “had a lot of issues with the stick”. Finally, we ended up making it through some of the obstacles with some degree of success, but by that time we were so close to the end of the session I decided to spend the little remaining time reinforcing what we had done instead of trying to rush into mounted work without enough time to accomplish anything positive. The next session, taught by the British, was actually called Obstacles, but in my opinion it presented fewer challenges than the “Groundwork” session. We were mounted for the entire session, and the main focus was to train the horses to be immune to distractions. We had to walk over mattresses and tarps, with flags waving in the horses’ faces and balloons bouncing around their heads, which Crossbo did very well in spite of his cantankerousness in the previous session. I think the major difference was that the entire group repeatedly circled through the course in single file, while in the first session each horse faced the obstacles individually. 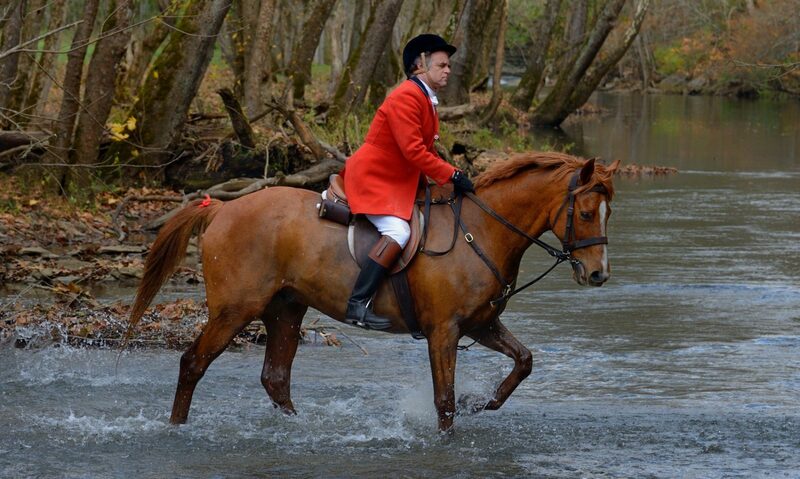 After a season of hunting, Crossbo will follow a group of horses through damn near anything, but he’s a little less confident solo. (And, for those who think walking over a tarp is no big deal, that rustling underfoot can bother a horse more than you realize. There were several horses who had major issues with it, and would not even follow the others over it. In fact, the only fall of the clinic was when the horse right behind Crossbo spooked at the tarp and bolted, dumping his rider in the process). Lunch break followed the second session, and at that point I was feeling bold enough to spend the first part of the break sneaking back across the ocean to the “Lexington” end of the arena to ride through some of the stuff that we didn’t get to do in the first session. It was really a confidence booster (maybe too much so), as we successfully braved most of the obstacles, even the dreaded teeter-totter. After lunch, we had an equitation session taught by the RCMP. These guys are serious riders. In fact, equitation is their sole purpose. Unlike the other forces, where the mounted units do real police work (and have some great arrest stories), the mounted unit of the RCMP is strictly ceremonial, for parades and such. For those who may be getting a little confused at this point, the RCMP is a real police force (I’ve even been pulled over by them, when neither the officer nor I was mounted), but, despite the name, most of them are not mounted. 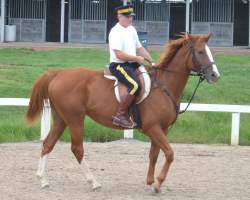 The ones that ride are real police officers who take a three year “break” from normal police work to participate in what they call “The Musical Ride”. Before we began the real work in the morning, we had an introductory session. One of the organizers introduced the instructors and discussed the strengths and emphasis of each force. She said it was always fun to see one of the RCMP say to a participant, “Excuse me, could I ride your horse for a minute?” She said even the rankest horse would undergo an amazing transformation. In our case, I don’t think Crossbo was behaving badly. I think the instructor just felt that he wasn’t performing to his full potential due to the handicap in the saddle. (In the computer business, we call this PEBCAK: Problem exists between chair and keyboard). And apparently the organizer was right. Crossbo became a different horse with the Mountie in the saddle. I’m not enough of an equitation geek to know what I was seeing, but apparently it was amazing. A couple of my hunting buddies who were watching said “OK Matt, we expect to see that in the hunt field this season”, and I didn’t even know what “that” was. The instructor dismounted with high praise for Crossbo, saying he was a terrific horse after “a few minutes to get used to him; it always takes a few minutes to get used to a different horse.” I think what he really meant was it takes a horse a few minutes to realize he has a rider that knows what he’s doing. And I guess it’s a good thing he hadn’t seen Crossbo’s earlier obstinance in the first session. The equitation was the final instructional session of the day, followed by an optional obstacles competiton. This consisted of six obstacles, mostly variations of stuff we had done in the first session, with a time limit to get through the entire course. Obstacles could be skipped (with a loss of points) if the rider felt he was burning too much time. I felt really confident going into this, and pride goeth before a fall. Well, there was no real fall in this case, just a letdown. The first obstacle was a choice of a mattress (5 points) or a water obstacle (10 points). We had walked over mattresses all morning, and hadn’t had a chance to work with water, which is often an issue for Crossbo. So I decided to go for the easy 5. Crossbo said it wasn’t going to be that easy. He had no intention of stepping on that mattress again. Finally, with the clock ticking, I decided to go for zero on that one, and move on. The next one was the streamers we had ridden through that morning (after some hesitation), with the added complication of a mattress under them. Since he had balked at the first mattress, I was afraid that might be an issue here too. It wasn’t … because he never even got close enough to notice the mattress. He looked at those streamers and said “We ain’t doing that”. At that point, I made a decision that I’ve been kicking myself for ever since. We didn’t have much time left, and I decided that if I couldn’t get past the first two obstacles, I had no business being on the course. I said “We’re retiring” and walked out. ere near the top of the competition, but think I probably could have made it through some of the others if I hadn’t made that hasty surrender. Along with kicking myself for being a quitter, I’ve done a lot of thinking about the lessons I learned. First is Crossbo and I need to work on ground manners. Ironically, I was talking about that with one of the other participants before the clinic started, as we were walking from the barn to the introductory session. He said he spoiled his horses and let them push him around too much, and I confessed that I had the same problem. It’s time for some tough love. Also, I need to be less lazy. Crossbo usually does all I need him to do in the hunt field. At one point in the clinic, when I was discussing our issues with Officer Lisa, she said “Some people are happy with what they have, and if that’s good enough, that’s okay”. I’m happy with what I have, but I could be happier with more. Specifically, as I reflected on why I had so many unexpected problems, I realized the crutches I have in the hunt field that were missing in the clinic. The biggest one, of course, is all the other horses. Crossbo wants to keep up, especially when the adrenaline gets flowing. When we’re on a run, he’ll gallop through a creek without slowing down. Even with less adrenaline, and without the other horses, he’s more likely to go through an obstacle like water if there’s no way around it. If we get to a creek when we’re riding alone, he’s likely to hesitate for a while, but if urged forward, he’ll go through it if that’s the only way to go forward. But if I take him into an arena, and lead him up to a 4×4 foot water crossing and ask him to walk through it, he’s probably going to say “Why the hell should I? If I need to be on the other side, I can walk around the damn thing and not get my feet wet.” Unlike other horses I’ve ridden, he doesn’t have that attitude about jumps. Point him at a jump and he’s going over, even if he could easily run around. I’ve never had him try to run out at a jump. (We have had a couple of stops, but that was my fault). But walking through strange stuff is different. He won’t do it if he can avoid it. And that gets back to Lisa’s comment about “happy with what you have”. As I said before, he mostly “does what I need” in the hunt field. Maybe I could relax and be happy with that. But what do any of us really “need” from a horse? I don’t “need” to hunt at all; I do it because I like to. We keep horses because of the satisfaction we get from being a team with them. Obviously, some riders are more driven than others to “be all they can be”, and I’ve always been one of the lazy ones. But I think it’s worth just a little more effort to build a little more teamwork with Crossbo, so we can do a few more things that we don’t really “need” to. As would be expected from a one-day clinic, it provided more of an idea of where I need to go than a sudden improvement. If I follow through on that, the clinic will have been well worth it. Even if I don’t, it was still educational and fun, and worth the time and money spent. All the instructors were great to work with, extremely competent and gracious, wonderful ambassadors for their departments. 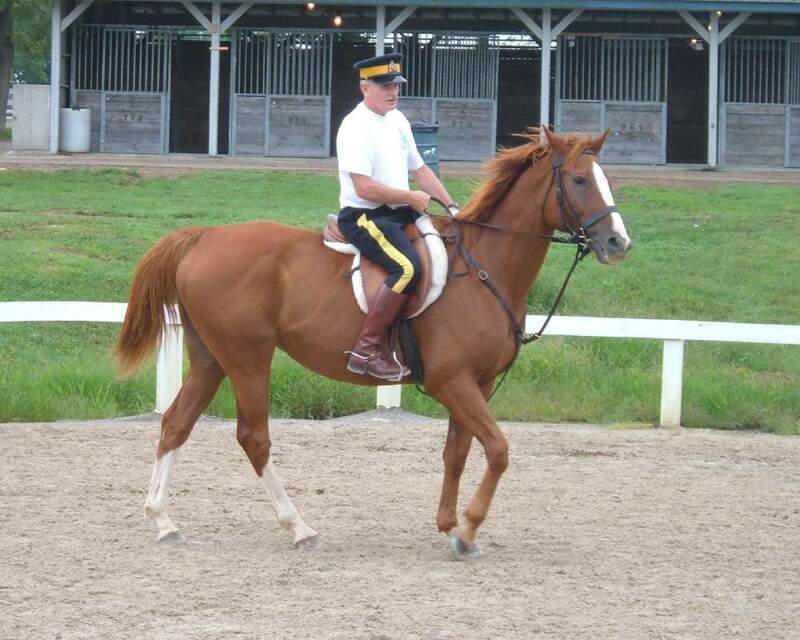 This clinic was actually tacked on to the end of a 3-day session for police officers, which drew in hundreds of officers and horses from around the country to train with these instructors, so that’s an indication of the quality of instruction. We were told that the only place these instructors train civilians is right here in Lexington. The organizers hope to offer the clinic again next year, maybe in a 2-day format. I would highly recommend it to anybody within reasonable hauling distance of Lexington. And there’s a very good chance that Crossbo and I will be back. We’re gonna nail that damn obstacle course. Next PostNext Where were you?